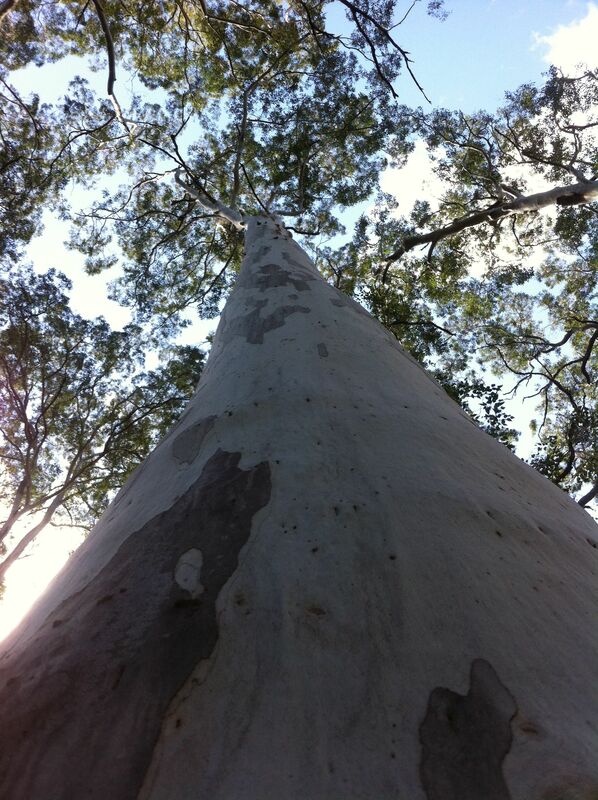 If I were to ask you for the plant that sums up Australia, would you say…… gum trees? Is there another genus of plant that has so dominated our landscape other than the ‘Ubiquitous Eucalyptus’? How has this one group that has over 900 species (and still counting) become so adept at surviving the harsh droughts, floods, fires and poor soils of the Australian continent? After our recent spate of bushfires in NSW I thought I might blow the dust and cobwebs off some of my university notes and remind myself how these amazing trees cope with fire. We hear the media talking of ‘destroyed bushland’ but are our eucalypt forests actually destroyed by fire? 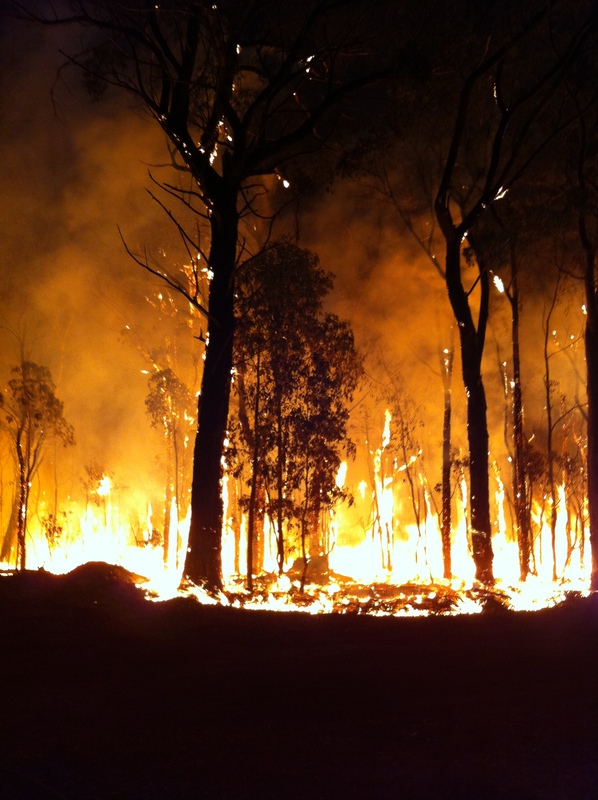 The responses of gum trees to fire are influenced by the nature of the fire itself. Fire intensity, frequency, variability, seasonality and extent are all factors that will influence the reaction of vegetation. Fires that reach the forest crown and run through the tree tops will obviously effect trees differently to low intensity ground fires. 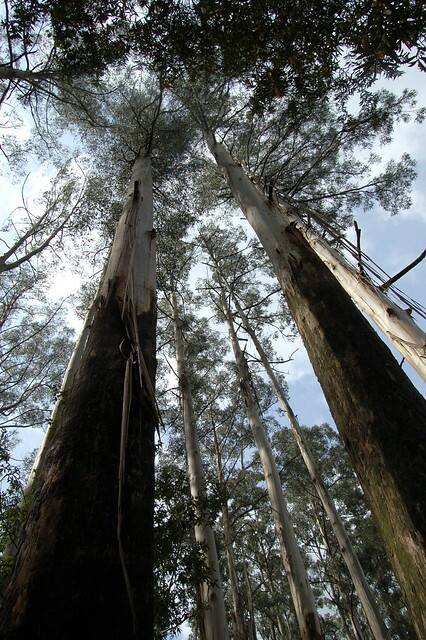 Eucalypts come in all shapes and sizes and can be tall forest trees (30-50m), woodland species (10-25m), or mallee species (multistemmed, <10m) and have about 4 categorised responses to fire. Some species (called obligate seeders) respond by throwing in the towel to fire. The adults yield their lives to a crown fire and throw off all the seeds they have been storing in the canopy for just such an event. The bare, nutritious ground exposed by fire and the lack of seed predators like ants provide a rich environment for new seedlings to flourish and the species continues. Problems arise for these species if another fire scorches the landscape before the new seedlings have reached maturity and set seed. They can be eliminated from an area by just such an event. Climate change and increasing fire frequency may exacerbate the problems for the obligate seeders. An example has been seen with the majestic Mountain Ash (Eucalyptus regnans) in Victoria in recent years. This long lived species – said to be the tallest flowering plant in the world needs fire to reproduce, but can take up to 20 years to reach maturity. Two fires within twenty years means local extinction. This occurred during overlap of the 2003 and 2005 Victorian bushfires. The flip side for the Mountain Ash is that in the absence of fire they can also become extinct as without it, they cannot reproduce! Some eucalypts cleverly store energy underground in a lignotuber. This is protected from fire by the earth and can happily resprout new stems after a fire. Many of these species are termed ‘mallees’ and can send up many new stems. Probably the most common method of fire survival and regrowth are the stem sprouters. I am sure we have all seen the fuzzy looking trees in the months after a fire as they send out new branches from ‘epicorms’ located under protective bark. Take a drive along Richmond Road in Western Sydney and this regrowth can be clearly seen in the Windsor Downs Nature Reserve after the intense fires that threatened Bligh Park recently. 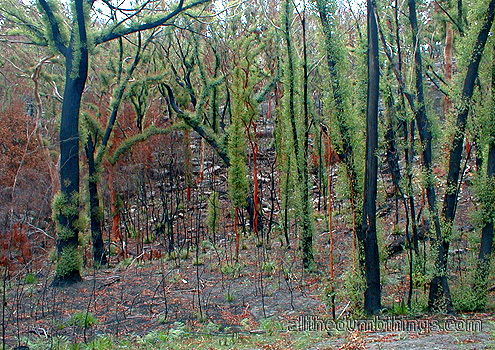 Epicormic regrowth can also occur after severe insect attack as happened in the Grey Box woodlands of Western Sydney. Some trees may also use a combination of lignotuber and epicormic regrowth to survive and flourish after a fire. With a changing climate and fire regimes, the ability of many of our native species to adapt may be challenged. Will eucalypts continue to dominate our landscape into the future? Great info here Steve, I love the way you write and the variety of topics you write on.